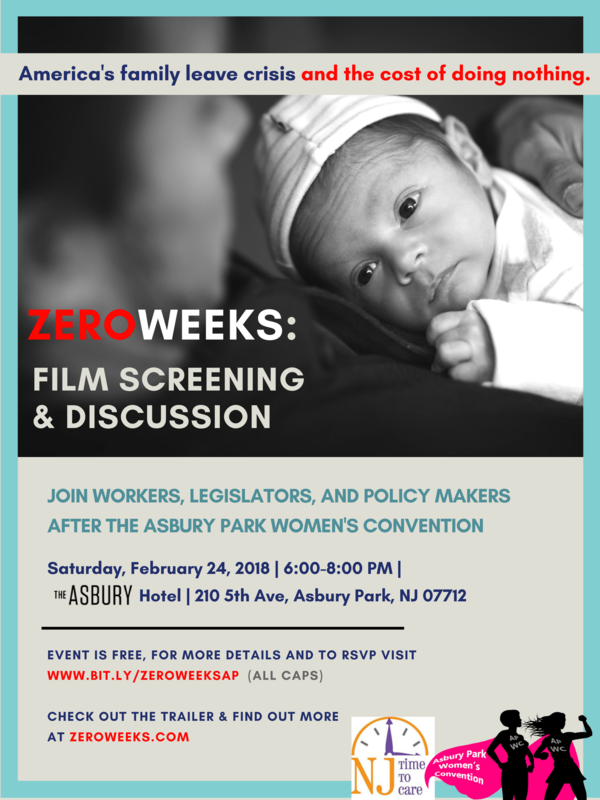 After grabbing diner in Asbury Park following the Women's Convention, join lawmakers, workers, and others at the Asbury Hotel for a free film screening of ZERO WEEKS, the first documentary to explore America's paid family leave crisit and the cost of doing nothing. Prior to the screening, a short discussion will be held with law and policy makers on what New Jersey is doing to help residents afford to put family first when its most important. Often sidelined as a "women's issue" paid family leave is an issue whose time has come! New Jersey is 1 of 4 states with a a paid leave program but we can do better! Join us to learn what you can do to help improve access to paid leave for all -- for more about the New Jersey program visit www.njtimetocare.org/NJFLI! Cash bar with special ZERO WEEKS cocktails and Snack Bar will be available. Space is limited so please RSVP to reserve your spot at this hot topic film screening. Plan on checking out the shore all weekend and stay at the Asbury Hotel, book your room, www.theasburyhotel.com who are our generous event sponsors.